If we could sit down together, I’d want to hear your story. Everyone has one. If you think I get up each morning, fill up my drip coffeemaker and settle in with my laptop to play with my imaginary friends (my characters, ok? I’m not really crazy) then think again. Oh, I’ve had days when I wonder what a life like that would be like, sitting in a wood-paneled office, with my fingers busy on the keyboard uncovering the great American novel, stopping in the afternoon to read email correspondence from adoring readers. But my life is far from the typical novelist: I’ve spent most of the last decade slugging it out day in and day out with the enemies of surgery in equatorial Africa. Enemies, you ask? Sure. HIV, cancer, bizarre tropical infections, trauma and tuberculosis just to name a few. Just this week, I’ve had to repair a femoral artery severed during a bone-splintering car accident, removed a huge (yes, that’s a common word we use to describe the cancers here) abdominal tumor in an elderly woman (I had to remove a portion of her stomach and colon just to get around it), stent open an esophageal cancer, help an old man urinate by removing the bulging prostate gland that had shut off his stream, and carefully excise an overactive thyroid that had caused a young woman’s heart to race ahead without reason. The writing part of my life comes at the bookends of days filled with sweat and blood. The sweat is mine; the blood, my patient’s. My clinics are filled with people who have long ignored their cancers and have often visited “traditional healers” who only worsened their situations. There is little time during the day to turn my thoughts to the craft of fiction, so that comes when the lights in the clinic are off and the last patient has either been admitted or found a ride up the rutted road towards the highway. I’ve been doing more and more work outside Kenya these days, because medicine opens the way into places of political turmoil and trouble, places where Christian missionaries are unwelcome. And surgery provides a practical way to love people desperate with physical needs and hopefully provide a small glimpse into who Christ is and was. What is it that motivates me, that makes me tick? Why sacrifice my comfortable life in America for this? And why, for that matter, do I spend the hundreds of extra hours it takes to write novels? It is not my love of writing or a passion for story (although I am passionate about that). It is not my love of surgery (although that too is a passion of mine). My greatest passion and motivation is to see Christ treasured in the hearts of all people. That may sound like an impossible goal to get a handle upon, but I believe it is helpful to understand the target and how my work may or may not fit. To this end, I believe medicine (and surgery in particular) is a wonderful field of God-sent opportunities: people come to surgeons in crisis. And these crises create a situation where people finally start asking the right questions about eternity. Many of these people would never seek out a pastor; but, by necessity, they find themselves in my office. And there, with permission, we hope to offer compassion, prayer and the science and art of healing surgery. Here in Kenya, I practice in a mission hospital setting and many of the patients come face to face with the Gospel during their hospital stays. It may be a word from a physician, a nurse, the woman who mops the floor, or a chaplain, but my prayer is that everyone has an opportunity to hear the greatest news ever! This same philosophy guides my writing. A novel is way too long of a project to write simply for entertainment. Don’t hear me wrong! I think entertainment is important; if I can’t capture and entertain, no reader will hang in there to the end. But in the process, I hope that a small message of hope, faith, or grace is absorbed. My desire is that Kraus fiction will nudge people closer to a life where Jesus is treasured. To that end, I desire my protagonists to be real: people with problems. Not all of my protagonists are Christians; many, like Tori in this book, find faith as a result of the conflicts they face. When I write about a Christian character, it is important to me to show them as real people with real life issues. Christians struggle with doubt, Christians have pain, Christians are tempted, Christians fall, get angry, and struggle with materialism and lust. So, if you are reading Kraus fiction, expect a transparent look into real life. You won’t see a rose-pedal strewn pathway for the Christians in my novels. That’s just not reality. I hope that if we ever have any real face-time together, you will see the same kind of transparency in my life. I’m a Christ follower, but I am a ragamuffin. I sin and I don’t like wearing masks that say, “I’ve got it all together.” Lots of folks like to put authors, surgeons, and missionaries on pedestals, so you understand, some people have a problem putting me in an elevated place where I don’t deserve to stand. When I look down, I’d better be standing on a pedestal of grace, or I’m setting myself up for a fall. I sincerely believe that the world doesn’t need more perfect Christians; the world needs transparency! Christians who are willing to say, I haven’t got it all together, but I’m holding the hand (actually, I’m engraved on His!) of the one who does. It's been too long since I last added to this blog. Partly, it's because I've been looking forward to transitioning my blog to another site: www.threemenwalkintoablog which is going to open soon (I've been saying that for a while, but I really mean it this time). Three men walk into a blog? Yep, three authors: James Rubart (bestselling author of Rooms), Dan Walsh (bestselling author of The Discovery) and myself, joining forces to blog about literary life, Christian issues, writing tips, men stuff, family stuff, marriage, current issues, faith, missionary life and just fun. We've been talking about this move for some time. We want the blog site to be informal, but we won't avoid tough topics, either. It will be a conversation, three friends sharing life with all the warts and back hair (OK, I don't really anticipate talking about back hair, but you know what I mean): we aren't going to polish the appearance of the Christian walk so that it's not recognizable. We are Christian men, but we are men in need of grace. So you won't get platitudes or pedestals. Hopefully, we can be transparent and insightful. Another reason I've avoided blogging lately. I think I'm as close to missionary burn-out as I've ever been. There's nothing really serious going on, no extra spiritual war (although maybe discouragement is an enemy attack), and no relationship problems. I think it's a combination of things. I've allowed myself to listen to the rumor mill too much. I live on a Kenyan mission station where a lot of the work, rightfully so, has been turned over to national staff. Recently, I've gotten an earful of reports of corruption among hospital and station leadership and staff. Some of it is phooey. Some of it might be real. Temptation to twist things in your favor financially (and outright stealing) runs strong in this place where most of the staff live close to poverty levels. When I hear rumors, mostly I just keep my head down and keep working. There is so much good going on in this place; so many people getting medical care, and so many people coming to faith in Christ. I need to remind myself of this when I hear the negative wind that blows. The Bible tells us to not be weary in well doing. Hebrews 12:1-3 encourages us to keep our eyes on Jesus so that we will not become weary and faint. So perhaps, I've let my eyes slip from their focus on Christ and on to disgruntled or jealous worker-reports. Another source of discouragement is seeing a series of poor outcomes (deaths) among our patients here. We are often the last stop in care, unlike in the US where I could always make a referral of a tough case down the line to the University hospital. Here, if we don't offer care, it usually won't get done at all. That means we often try difficult and complex surgeries as a last resort. Sometimes, we rejoice in a good outcome. Sometimes, we are sobered by our failures. Surgery is like that: results, good and bad, are often apparent quickly. Anyway, I'm trying to fix my eyes on Christ! 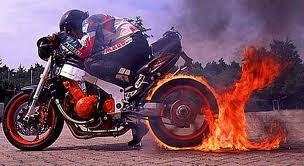 So that explains the photograph: it was the closest thing to a picture of burnout I could find. And besides, I love motorcycles. It's been a character flaw since I was a young boy and took my first ride on a friends minibike purchased from the local hardware store. Some good news: I'm returning to the US, leaving in two days! I'm coming home for a month and get to see my second son get married. So relief from this work is on the way. Pray that I'll returned rested and ready to work again.